R.A. Dickey had an offer from the Seattle Mariners on his table and a soft spot for them in his baseball heart, but when he sorted through the opportunities for 2009, one team separated itself. Dickey, who pitched most of this year with the Mariners, said Wednesday that he has chosen the Minnesota Twins, who want him to pitch out of their bullpen. Dickey, 34, said he also had an offer from the New York Mets, and the Milwaukee Brewers also showed serious interest. He agreed to a split major-minor league contract with the Twins – he’ll receive one level of salary while he’s in the major leagues, but another during any time he’d be in the minors. The Mariners also offered a split contract that potentially could have paid more money, but Dickey was lured by a greater sense from the Twins that he’d begin the season in the big leagues. 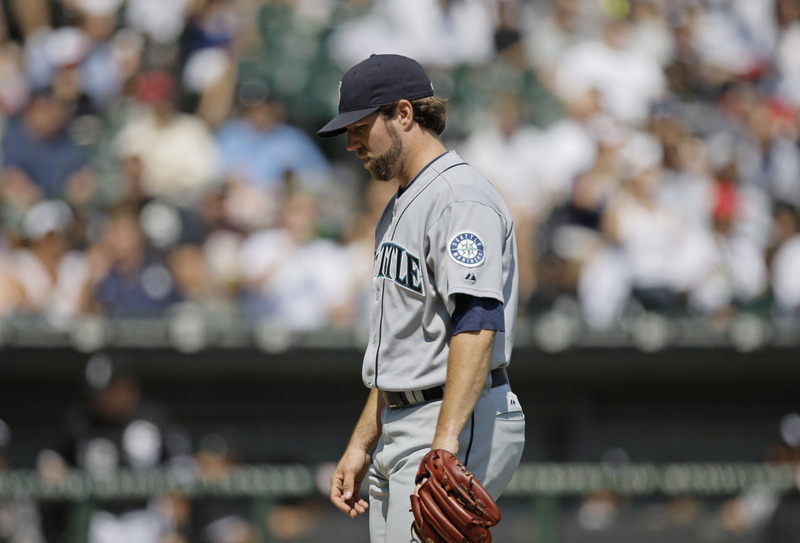 It leaves the Mariners with one less option in a bullpen where several roles are uncertain. Besides long relief, where Dickey could have pitched, the Mariners also must decide who will be their closer and left-handed specialist. General manager Jack Zduriencik said he, manager Don Wakamatsu and the coaches have yet to discuss the makeup of the roster, including bullpen roles. “As I said to (Dickey), until Don and I and his staff get together and discuss this thing in detail, there are a lot of options,” Zduriencik said. “Him coming on board would have been another option. Among the current pitchers, the possibilities for long relief include left-hander Jarrod Washburn, a longtime starter who goes to spring training without a place in the rotation; right-hander Miguel Batista, who also has lost his starting role but will be considered as closer; and left-hander Cesar Jimenez, who started twice last year and isn’t a candidate for the lefty specialist job because of his mediocre slider. Dickey has been on the Twins’ radar more than a year. They signed him to a minor league contract last off-season before the Mariners selected him in the Rule 5 draft. After Dickey declined the Mariners’ attempt to outright him to the minor leagues – making himself a free agent – the Twins immediately contacted him. “It’s so much more about that than what Seattle didn’t offer and didn’t say,” he said. Dickey went 5-8 with a 5.21 earned run average this year, when he started 14 games and relieved in 18 others. He was much more effective as a reliever, going 2-0 with a 2.00 ERA. Dickey said he’s indebted to the Mariners for the opportunity they gave him this year. It was his longest stint in the big leagues since he converted from a traditional-style pitcher to a knuckleballer.